The holy trinity, mostly Pinot Noir with a third of Chardonnay and the balance Pinot Meunier. The selection of fruit is crucial to the integrity of the finished wine. A total of seventeen Grand Cru or Premier Cru from distinguished vineyards in the Montagnede Reims, including Grand Cru Pinot Noir from Verzenay and Premier Cru Pinot Meunier from Ludes, Grand Cru Pinot Noir from Aÿ in Grande Vallee de la Marne and Grand Cru Chardonnay from Le Mesnil-sur-Oger on Côte des Blancs, one of the finest Chardonnay vineyards in all France. Beginning with the Bouzy vineyards that originally belonged to founder Philippe Clicquot, subsequent generations, particularly Madame Clicquot, gradually built up the Veuve Clicquot holdings to create one of the most impressive estates in all Champagne. There are some five hundred hectares, half belong to Veuve Clicquot and over a hundred are owned by the LVMH group. The vineyards boast an exceptional average classification of close to 97. Vines are mostly planted to hillsides where soils are shallowest and exposure to the sun is at a maximum. Significantly, Veuve Clicquot adds only a light liqueur doseage during the wine's disgorgement, allowing full expression of the essential Veuve Clicquot style. Pale gold, silver hues, brilliance, effervescence, a fine and long lasting bead. The nose opens readily, the aromatics are pure yet complex. Chardonnay contributes refined mineral character accompanied by pleasant floral notes of acacia, yellow fleshed fruit, marzipan and brioche. Silky and generous, a wealth of flavours, a deliciously long and powerful finish. 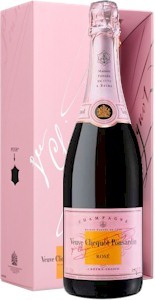 Elegant, remarkably well balanced, the perfect accompaniement to refined cuisine.